The life of a Stormtrooper was rough. In those early Republic days, enlistment itself was near impossible. You first had to be a direct clone of Jango. Those intensive DNA limitations pretty much eliminated any chance for most of us from joining up. Those lucky enough to be completely identical right down to DNA then had to endure years of tough training on Kamino. And, even after all that, let’s just say that the aiming of blasters was… problematic. So, with such terrible restrictions and additionally awful training on blaster fire, you were basically guaranteed to be killed or at least strangled by an angry Sith Lord. Anyway, it is time to equip up your little recruit! This Child Deluxe Star Wars: The Force Awakens Flametrooper costume comes not with easily misfiring blasters but with a powerful flamethrower! 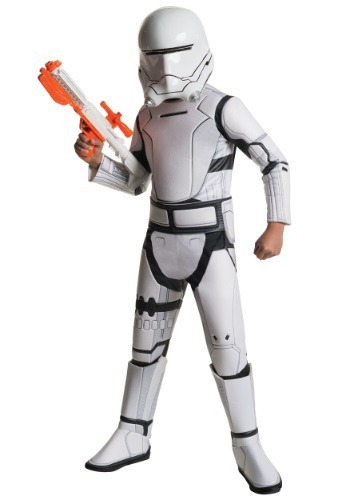 … Of course, it is still the Empire, so the actual weapon isn’t included in the base armor set, but the foam padded jumpsuit, boot tops, and two-piece mask will at least be easy to don and provides actual protection from lasers!